With friends like former President Bill Clinton and current Israeli Prime Minister Benjamin Netanyahu, what is a fellow like President Obama to do? As a start, he could get a few second opinions. President Obama is struggling to help resolve an ugly civil war in Syria. He is also working to relieve U.S. tensions with Iran, which has just elected Hassan Rowhani (left), a moderate, as its new president. For most observers who are not in Israel’s rapidly shrinking circle of friends, the news of Rohani’s election is reassuring. The new president won with 50.7 per cent of the vote, avoiding a run-off with his closest opponent who had only 16 per cent. 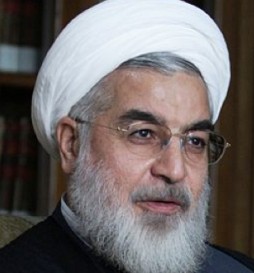 Rowhani’s victory should be good news for easing tensions in the region. What is not so good for Obama is the advice and public shoving he is receiving from his two self-serving friends, Clinton and Netanyahu. The only cleric in the list of six candidates, Rowhani has served in the past as an effective nuclear negotiator for Iran. He has shown that he is a man willing to negotiate. The civil war between Syria’s government and its rebel opposition is the second Middle East crisis currently confronting Obama. Until now, President Obama has refrained from any military involvement in that war. Until, that is, former President Bill Clinton suggested it was time for Obama to look back at Clinton’s actions in 1999, and take his own bold action..
Maureen Dowd reports that Clinton, whose wife is almost certain to run for president in 2016, shoved Obama out of his previous cautious stance on military action in Syria. In a rare act of disloyalty as a member of the club of former presidents, Clinton joined the chorus of war drum-beaters to persuade Obama to supply small arms to the rebel side of the Syrian civil war. It is of considerable importance to pro-Israel U.S. politicians like Clinton, that anti-Israel Hezbollah forces helped Syrian government forces retake Al-Qusayr, a crucial border city between Lebanon and Syria. If Israel does not want any help to go to its enemy, Hezbollah, then Bill Clinton is with his Israeli friends. There is, after all, money to be raised for Hillary’s race in 2016. So what does Bill Clinton do? Citing his own experiences in Kosovo and Bosnia, Clinton said that if you blamed a poll for a lack of action, “you’d look like a total wuss.” He added that “when people are telling you ‘no’ in these situations, very often what they’re doing is flashing a giant yellow light” of caution. For a former president to imply that a current president, of his own party, is in danger of looking like a “wuss”, is not exactly a supportive comment. It is, in fact, downright insulting. In sharp remarks directed against his Democratic successor and his wife’s former boss, President Bill Clinton said Tuesday that President Barack Obama risks looking like a “wuss,” a “fool,” and “lame” for not doing more to influence events in Syria. Clinton, speaking with Sen. John McCain Tuesday night in a closed press event sponsored by the McCain Institute, contrasted Obama’s inaction in Syria to his own action in the 1999 NATO intervention in Kosovo, which included the bombing of the forces of Serbian President Slobodan Milosevic. For a man who served two terms as president, Clinton knows better than to compare apples to oranges in a sensitive political decision. Kosovo was then, Syria is now. In addition, the political dynamics in 1999 are totally different from 2013. Coming so late into the conflict, Mr. Obama expressed no confidence it would change the outcome, but privately expressed hope it might buy time to bring about a negotiated settlement. We must also assume that by now President Obama has been informed of what, if true, is a dangerous new development, also reported by Fisk, who writes that Iran will send 4,000 troops to assist Syrian government forces. The profound effects of this great schism, between Sunnis who believe that the father of Mohamed’s wife was the new caliph of the Muslim world and Shias who regard his son in law Ali as his rightful successor – a seventh century battle swamped in blood around the present-day Iraqi cities of Najaf and Kerbala – continue across the region to this day. A 17th century Archbishop of Canterbury, George Abbott, compared this Muslim conflict to that between “Papists and Protestants”. Who are the players in this deadly game? America’s alliance now includes the wealthiest states of the Arab Gulf, the vast Sunni territories between Egypt and Morocco, as well as Turkey and the fragile British-created monarchy in Jordan. King Abdullah of Jordan – flooded, like so many neighbouring nations, by hundreds of thousands of Syrian refugees – may also now find himself at the fulcrum of the Syrian battle. Up to 3,000 American ‘advisers’ are now believed to be in Jordan, and the creation of a southern Syria ‘no-fly zone’ – opposed by Syrian-controlled anti-aircraft batteries – will turn a crisis into a ‘hot’ war. So much for America’s ‘friends’. The reason President Obama needs to stop listening to Benjamin Netanyahu is obvious from Netanyahu’s immediate response to the Iranian election result. You can almost hear Netanyahu’s dismissive reaction, “nothing new here”. This from the leader of a state that spent eight years attacking Iranian President Mahmoud Ahmedinejad as someone who wanted to “wipe Israel off the map”, a phrase which was mistranslated, but used, nevertheless, to demonize Ahmedinejad in western political and media circles. Ahmadinejad did not use that phrase in Persian. He quoted an old saying of Ayatollah Khomeini calling for ‘this occupation regime over Jerusalem’ to ‘vanish from the page of time.’ . . . It was apparently some Western wire service that mistranslated the phrase as ‘wipe Israel off the map’, which sounds rather more violent than calling for regime change. Martin Indyk, who most recently served as U.S. Ambassador to Israel, took Netayahu’s side, writing in the Financial Times. Mr Rowhani has a long record of association with the moderate camp in Iranian politics, serving as national security adviser to the pragmatic President Akbar Hashemi Rafsanjani and, subsequently, the reformist President Mohammad Khatami. In that capacity, he headed Iran’s nuclear negotiations with the EU3 (Britain, France and Germany) a decade ago, and agreed to suspend Iran’s enrichment programme during that period. We should be careful, however, not to let our hopes get ahead of realities. The sanctions are indeed hurting; the Iranian people want an end to their isolation; and by winning a majority in the first round Mr Rowhani has received a resounding mandate for change. But Ayatollah Ali Khamenei remains very much in command. Indeed, this election may have solidified his reign: rather than protesting against him as they did in such massive numbers four years ago, the people were celebrating in the streets after this election. And his radical regime now has a moderate, democratically elected president to cloak his own extremism and paranoia. Reading the standard Netanyahu-Indyk rejection of signs of hope from Teheran, calls to mind a scene from Stanley Kubrick’s 1964 film, Dr. Strangelove or: How I Learned to Stop Worrying and Love the Bomb. Group Capt. Lionel Mandrake (one of several roles played in the film by Peter Sellers) rushes into the office of Base Commander General Jack Ripper (Sterling Hayden) with the good news that the base is not surrounded by enemy forces. Ripper, who has just given the order for a fleet of U.S. planes to attack the Soviet Union, is the only person with the code to recall the planes. The general is no mood to listen to Mandrake’s good news that there is no immediate threat from enemy forces. Instead, he informs a terrified Mandrake that “commies” are not to be trusted. President Obama does not need friends who are afraid of fluoridation to tell him how to handle political decisions. Seems as though President Obama took former President Clinton’s double-dog dare, given recent announcements (and rumors) surrounding Syria. Where were you President Clinton, when Romeo Dallaire warned you of the pending Rwandan genocide, he one that could have been stopped (he claimed with some authority), with 3,500 lightly armed marines? With Susan Rice (a.k.a. Paul Kagame’s best friend and accomplice to the conflict in eastern Congo) taking over the NSC and Samantha Power (architect of the effort to discredit the Goldstone Report) steering the ship at the UN, it seems as though President Obama will be replicating a whole litany of Clintonesque mistakes. Thanks for the excellent review, Jim. Old Colonial Recipe: Provide feuding Middle Eastern countries with sophisticated weapons and poison gas, in order to have them destroy each other, never mind killing a couple of million Iranians and Iraqis in the meantime. Why not? Destruction of Babylon (Iraq) is now done under false premises. And now the destruction of Assyria (Syria-Iraq) is under way. Will this some day be staged as a case of heathen vengeance, falsely portrayed as “Biblical vengeance”, by the spin masters and Hollywood? Seriously, well meaning democratic powers should be putting all their efforts into the Peace Conference in Geneva. Make it happen, regardless who is winning at any one moment. There is no military solution and everyone agrees on that. Obama and Putin, make it happen! Warmongers usually always win out in our country. Israel Firsters always win too. That’s America. Let’s face reality. The mainstream media also does it’s warmongering chorus, and it’s propaganda for Israel. That’s Americas too. It will take millions of dollars for people who want to challenge the warmongers and Israel Firsters.